For the second day in a row, I have been up before 7 am. This means being able to watch the early morning news shows for a change, and guess what I just heard? In the hopes of raising tax revenue and boosting the regional economy, the county told civil servants, including teachers, to smoke nearly a quarter of a million packs of the local brands every year. 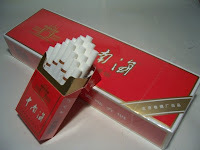 A statement posted on the Gong'An government Web site today said the edict was introduced last month to crack down on illegal cigarette smuggling and the trade in counterfeit cigarette brands, claiming that it harmed consumers and led to losses in revenue for the government. What can I say? It's crazy, yet hilarious at the same time. If you want to smoke more, go apply for a job with the Chines government.